Which box would you like Carol Merrill to reveal? Box number one or box number two? Today was my lucky day, I got to open both. 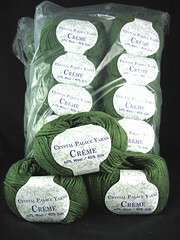 Box number one was from Crystal Palace Yarns, 23 balls of Crème in color #2031 Vine Green for the Cords & Cables Cardigan. Thanks Susan! Now where did I put that crochet hook? In box number two was a bunch of yarn to make the stupid big fun scarf that Stephanie shows at the end of this post. 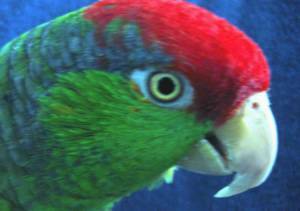 On Line 194 & Universal Yarn Inc Tango . I'm not making 6 scarfs, these are for a knitalong for the knitting group at work. 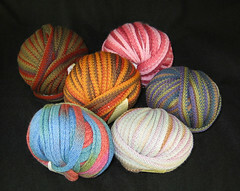 I can't believe how fast the yarn came--Stacey at Knit One sent them from PA on Saturday and they're already in CA. Thanks Stacey! I got that same yarn for that same scarf on the retreat! I must be way slower than Monica and Stephanie because they both claimed 2 hours, but it's taking me FOREVER. (OK, it'll probably be 4.) Can't wait to see all the different color variations! It is also at Full Thread Ahead. Not sure what colorways are there, but I saw it on the front table last Monday. I was gonna tell you that Cookie picked up some of that- but I see that she already did. That sweater is going to be really beautiful with all of that yarn! Can't wait to see it knit up.